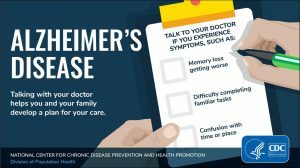 As many as five million Americans already have Alzheimer’s and other dementia-related conditions, and their resulting loss of cognitive capacity and personal control rank among the top causes for health dread among those 55 and older, polls show. So it’s worth noting that new studies are showing that seniors 65 and older get on average a dozen years of good cognitive health ── and that span is expanding. Further, the onset of problems typically may occur in relatively mild fashion, with the most serious cognitive decline occurring in a short but late period of 18 months or so, Judith Graham reported for the independent, nonpartisan Kaiser Health News Service. In her story for the KHNS feature “Navigating Aging,” Graham looks at an array of the latest and reliable research on seniors and cognitive decline, finding glimmers of optimism in what has been increasingly gloomy, evidence-based studies on how huge a challenge may be posed for our fast-graying nation by dementia, Alzheimer’s and their care. Experts see some dire scenarios, in which there may be a doubling of Americans 70 and older having dementia (hitting 13.8 million people in 2050 vs. 3.8 million in 2010), with the nation’s spending for care for these individuals rising in the same period from an estimated $159 billion to $215 billion to as much as half a trillion dollars. With significant numbers of Americans, especially women, already making giant sacrifices ── giving up jobs, careers, and major household income ── to care for loved ones with dementia, a panic has been developing among public policy experts, public health officials, and lawmakers. This anxiety also has risen in households and at the individual level: Few seniors want to contemplate the memory loss, wandering, and uncontrolled speech and other personal behaviors that can be big parts of late-stage dementia and Alzheimer’s. Graham reported that dementia rates have declined slightly as the demographic tsunami of baby boomers washes through American society. More of the elderly are better schooled than their predecessors. Experts have noted that higher levels of education, with their concurrent increases in self-care and continued intellectual and emotional engagement in aging, appear to help stave off the onset of dementia and Alzheimer’s. The conditions are more prevalent in oldest age, so many experts have argued that it is critical for seniors to protect and preserve their health as long as they can, with the hopes of dying of old age or other common conditions before debilitating dementia and Alzheimer’s set in. Individuals who don’t smoke, exercise, eat well, and drink moderately increase the likelihood of maintaining their cognitive health and capacities, Graham says researchers have found. Healthy living can give American seniors on average 12 years after age 65 of good cognitive condition, and, as more of the elderly keep up beneficial lifestyles, this span is increasing. As seniors experience greater impairment and cognitive loss, they may experience increased frustration and rising unhappiness, experts said, though they also cautioned that it becomes difficult to gauge satisfaction and happiness levels as patients’ capacities decline. In my practice, I see not only the huge harms that patients suffer while seeking medical services but also the havoc that can be wreaked on the aged by nursing home neglect and abuse. The Kaiser Health News reporting on dementia, Alzheimer’s, and how seniors may decline cognitively provides a good balance to gloom-and-doom views about our nation’s aging crisis. The report also should enforce the importance for all of us to protect our own health, and to advocate for ourselves, our families, friends, and loved ones as the nation sets its public policy priorities, such as for elder health and care. We need to think ahead to see how we hope to be treated, if our care exceeds what our loved ones can provide, for example, by researching in advance issues like the best nursing homes available to us. We cannot allow partisans to strip away invaluable social support programs like health insurance via public exchanges (aka the Affordable Care Act or Obamacare), Medicaid, Medicare, and Social Security while lavishing tax cuts on the richest Americans and already wealthy corporations. Muster some cognitive capacity and don’t forget to vote in what may be some of the more critical midterm elections we have seen in a while.